Huge rumor coming from an unnamed source within the Penguins themselves regarding the Penguins coaching search. Click "Read More" for the info. 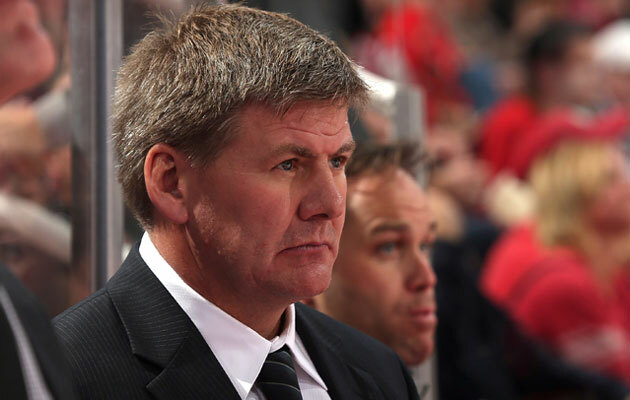 A source within Pittsburgh's organization told Pens Initiative the story behind the apparent coaching issues that have hamstrung the Penguins' efforts in procuring a new coach. The problems start near the top, but not at the management level most fans think. The issues began with the proposed hiring of Bill Peters. His possible appointment, rumored to be all but done, led to assistant coaches being brought on by new Associate GM Jason Botterill in anticipation of the assumed head coaching hire. Unfortunately, in acquiring the assistants ahead of time, and against the advice of new GM Jim Rutherford, Botterill put the proverbial cart before the horse, and once the hiring of Peters fell through, the Penguins' coaching team became an army without a general. The only name mentioned (outside of Peters) by our source was Rick Tocchet, who is said to already be on board as an assistant coach. To recap: Our source within the team says that Peters was offered the position, and Peters' hiring was believed to be a sure thing. Botterill went against the wishes of Rutherford and hired a staff for the assumed new coach. Now, the Penguins are stuck without a coach but have hired assistants, very likely including Rick Tocchet. What an embarrassment of an offseason this has been. Just go ahead trade Neal and their 1st round pick for flop-fest Kesler and complete the shame. Exactly right sir. They seem to think that Kesler is the answer to everything - just plain stupid! Yinzers are going to lose their minds if this coaching situation isn't Rutherford's fault. Not to be a pain in the rear, but Botterill is the "Associate" GM and not the "Assistant" Doubtful he'll be going anywhere and I don't think he should. By flops, this is a gaffe and a rocky start, but it could happen to anyone eager to get things moved along. Heck in Toronto, people are critiquing how Leafs players get out of bed in the morning, much less their work in practice or God forbid performance in a game. let's all take a step back, have some faith and see what they do with the other 95% of this offseason that is left before us.